A well planned wedding reception timeline serves as a checklist and helps the bride and groom form a mental image of the wedding reception order of events. The bride and groom discusses the wedding reception program with the reception manager and the wedding master of ceremonies (MC), in order to create a wedding reception itinerary for your wedding. This is to ensure all your needs are met and everything runs smoothly and on time. For your interest; a comprehensive step by step wedding emcee sample script for those of you that have been given the task of the wedding MC for the reception. The order of the wedding reception program or sample master of ceremonies script can be changed and customised to suit your own ideas and customs. The bride and groom would have had their wedding photos taken (following a detailed wedding photography checklist) before they arrive at the wedding reception. Some photo's will be taken at the church and the others could be taken at a nearby picturesque location with the entire bridal party and bride and grooms family. The newly weds are then chauffeured in a luxury limousine while enjoying scenic water views, drinking french Champagne and eating canapés. On arrival, the drinks waiter offers your wedding guests a choice alcoholic and non-alcoholic beverages. Pre-dinner finger food. A waiter offering canapés to the wedding guests while they are mingling. The first thing on your wedding reception agenda is to place at least one wedding usher at the wedding reception before the wedding guests arrive. A wedding reception usher can be male or female, usually a trusted friend or relative. Their job is to greet wedding guests and collect wedding gifts, on arrival. The reception manager works with the wedding usher/s directing the guests to their seats and crossing off their names as they arrive. In some cases, a second wedding usher collects any money gifts on arrival (placing the money envelopes in a decorative box) and pinning a small boutonniere on the guests clothing (optional). Create your wedding reception itinerary from the sample wedding reception program below. You can use the customised wedding reception program samples to suit your own wedding. If you wish to change some of the order around a little, just change the elements as you see fit. The information below is merely a guide to help get you organised - it is not a set of rules. Accommodate your own customs and specifications by changing the order of wedding reception as the need arises. Your guests arrive at the wedding reception, they are greeted by a wedding reception usher and/or the reception manager. 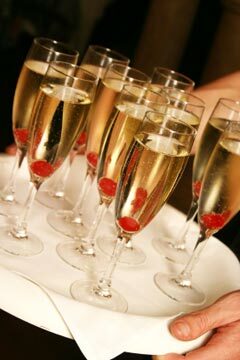 On arrival, the drinks waiter offers your wedding guests a choice alcoholic and non-alcoholic beverages. Your guests are either given their table numbers or escorted to their tables. In some cases the guest can look up their own table number and seat themselves. 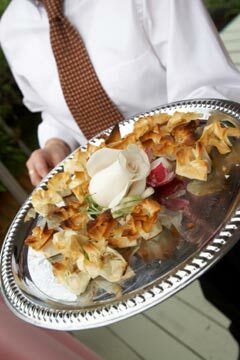 A food waiter walks around offering canapés to the wedding guests while they are mingling. The Master of Ceremonies (MC) announces that dinner will be served soon and asks your guests to make their way to their seats. The bridal party is announced: The Master of Ceremonies introduces the bridal party. Firstly the bride’s parents, groom’s parents, the bridesmaids and groomsmen, the maid of honour and best man, then the ring bearer and flower girl and last of all the newly weds. The bride's father makes a short speech and welcomes everyone to the wedding reception and thanks them all for coming. First course of dinner is served. The Bestman makes a toast to the newly married couple. The MC or DJ annouces the first dance for the newly weds. After the first dance, the rest of the bridal party is asked to join the dance floor. The MC or DJ annouces that everyone else can join the dance floor. The MC or DJ annouces the cutting of the wedding cake. Wedding cake and coffee or tea is served. The newly weds thank their wedding guests and say their goodbyes. A wedding reception program is an essential overview, not only for your guests but also for your Wedding MC. 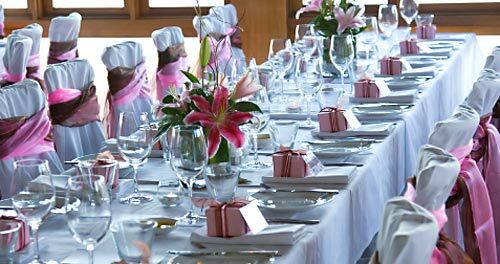 It ensures your wedding event is executed in sequence and according to your plans. Nothing is forgotten and nothing left to chance. You have a time limit at the reception, so you can't afford to let certain elements go over time. Just think of Acadamy Award winners being reminded of the timetable by the orchestra. Plan with care and your wedding reception will be amazing.